Objective: Physical restraints are used in intensive care units (ICUs) to prevent patients from harming themselves. In this study, we identified the physical restraint practices of nurses in ICUs and investigated their knowledge on this subject and factors affecting their decisions to use restraints. Material and Methods: This was a descriptive and cross-sectional study. 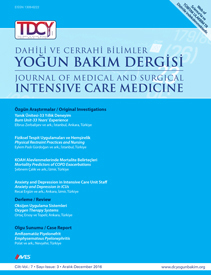 The sample group consisted of nurses (n=101) who worked in the ICUs of a university hospital and a state hospital in Edirne. Data were collected using the “Questionnaire Form,” which included working life and demographic characteristics of the nurses, and “Attitudes, Levels of Knowledge, and Practices of Staff Regarding the Physical Restraint Questionnaire.” Data were evaluated using percentages, arithmetic means, percentages, and Mann–Whitney U and Kruskal–Wallis tests using IBM SPSS Statistics 21.0. Results: It was found that 62.4% of the nurses did not receive training on the use of physical restraints and that 81.2% of them practiced using physical restraints if required. The mean score of knowledge, attitude, and practice of the nurses on physical restraint use were 7.6±1.6, 30.4±4.2, and 36.8±3.7, respectively. A relationship was found between the knowledge score on physical restraint use and education on physical restraints (p=0.02) and between the attitude score on physical restraint use and the nurses’ education degree (p=0.03). A statistical difference was found between the working units (p=0.002) and education on the use of physical restraints (p=0.000). This study found that only 38.6% of the nurses always used physical restraints on a physician’s order. Conclusion: We found that although a majority of nurses working in ICUs did not receive training on the use of physical restraints, the level of knowledge on nurses’ use of physical restraints and their attitudes to practice restraint use was positive. However, nurses’ practice on the use of physical restraints on the order of the physician and the approval of enlightenment were not to the desired level during the practice of physical restraint use. It would be useful to focus on the responsibilities of nurses in relation to the topic of in-service training to be organized on the use of physical restraints.